"I made this one year for my dog and she ate it all up. The honey is optional, but it makes it sweeter for the dog...and yes, I tried some. It's pretty good." Preheat oven to 350 degrees F (175 degrees C). Grease a 6 cup ring mold. Combine the egg, peanut butter, oil, vanilla, and honey, if desired, in a large bowl; blend well. Stir in the carrots and mix thoroughly. Sift together the flour and baking soda and fold into the carrot mixture. Spoon cake batter into prepared pan. Bake in preheated oven for 40 minutes. Let cake cool in pan for 10 minutes; then turn out onto a wire rack to cool completely. 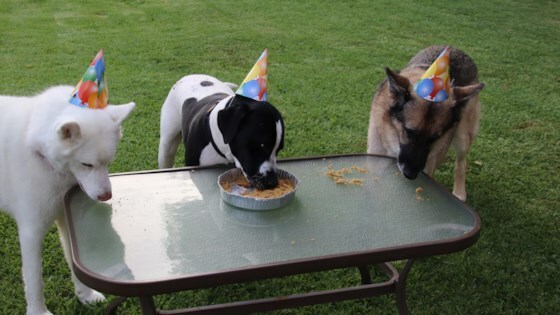 Treat your loyal canine pal to delicious doggie birthday cake. You can use a fluted tube pan, such as a Bundt® for this recipe. I threw my puppy a birthday party for his first birthday and made this along with a couple of other doggie dishes. This turned out awesome! I cant wait to make it again next year. Used this recipe to make pupcakes for my Dudley's 4th birthday. The "kids" loved them. Used extra peanut butter to frost, and yogurt drops to decorate. Thanks!